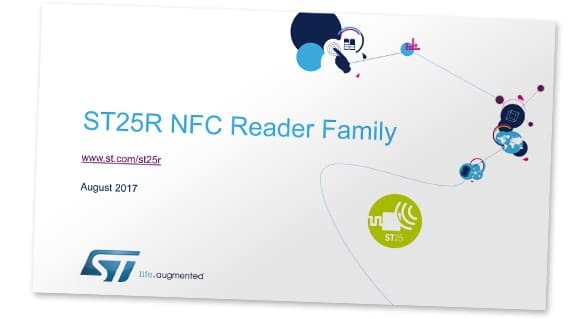 An in-depth presentation on STMicroelectronics’ ST25R NFC reader family that sets out the technical requirements for integrating NFC services in a wide variety of markets including payments, access control, connected homes and automotive applications is now available to download from the NFC World Knowledge Centre. The 48-page presentation outlines the technical requirements for each use case, gives details on the company’s product range and provides detailed technical information on features including automatic antenna tuning, automatic modulation depth adjustment, output power and efficiency, VHBR (Very High Baud Rate) technology and antenna options. Readers can download the presentation from the NFC World Knowledge Centre here.